materials • Nymo D beading thread • Beading needles, #12 • Optional: 1 in. (2.5cm) pin back, 1 x 1 in. square Ultrasuede, E6000 glue fairy (purple figure) Japanese cylinder beads as follows: • 93 Silver-lined gold (DB042) • 103 White pearl (DB201) • 33 Opaque lilac (DB158) • 17 Black (DB010) • 204 Purple iris (DB004) • 2 Silver-lined dark purple (DB609) • 26 Matte transparent dark chocolate (DB865) • 1 Silver-lined red (DB602) • 6 Matte metallic gold (DB322) • 21 Ceylon light beige (DB204) • 200 Japanese seed beads, size 110, lilac • 36 6 x 2mm Czech pressed-glass rondelles, lilac • 18 6mm Pressed-glass bicones, violet • 18 10 x 3mm Pressed-glass daggers, violet angel (blue figure) Japanese cylinder beads as follows: • 1 Silver-lined red (DB602) • 8 Lined rose pink (DB070) • 21 Opaque salmon (DB206) • 86 Pale yellow pearl (DB232) • 120 Silver-lined gold (DB042) • 204 Opaque sky blue luster (DB215) • 34 Luster cobalt (DB277) • 17 Black (DB010) • 38 Matte transparent dark topaz (DB853) • 200 Japanese seed beads, size 110, gold • 36 6 x 2mm Pressed-glass rondelles, light blue • 18 4mm Round glass beads, blue • 18 10 x 3mm Pressed-glass daggers, dark blue Use brick stitch to create a beaded guardian by Jennifer Creasy These whimsical winged creatures can be made as pins, necklace pendants, or tree decorations. The double layer of fringe makes them especially festive. making a pin Glue a pin back to the completed fairy or angel with E6000. When dry, cut an Ultrasuede piece to fit over the base of the pin back and glue it in place. This also stiffens and stabilizes the figure. ladder stitch Figure 1: A ladder of seed or bugle beads is most often used to begin brick stitch: Pick up 2 beads. Leave a 3-4-in. (8-10cm) tail and go through both beads again in the same direction. Pull the top bead down so the beads are side by side. The thread exits the bottom of bead #2. String bead #3 and go back through #2 from top to bottom. Come back up #3. Figure 2: String bead #4. Go through #3 from bottom to top and #4 from top to bottom. 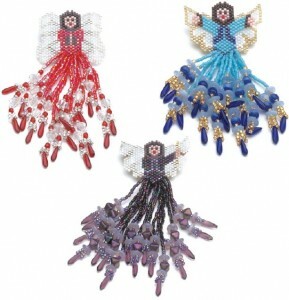 Add odd-numbered beads like #3 and even-numbered beads like #4. 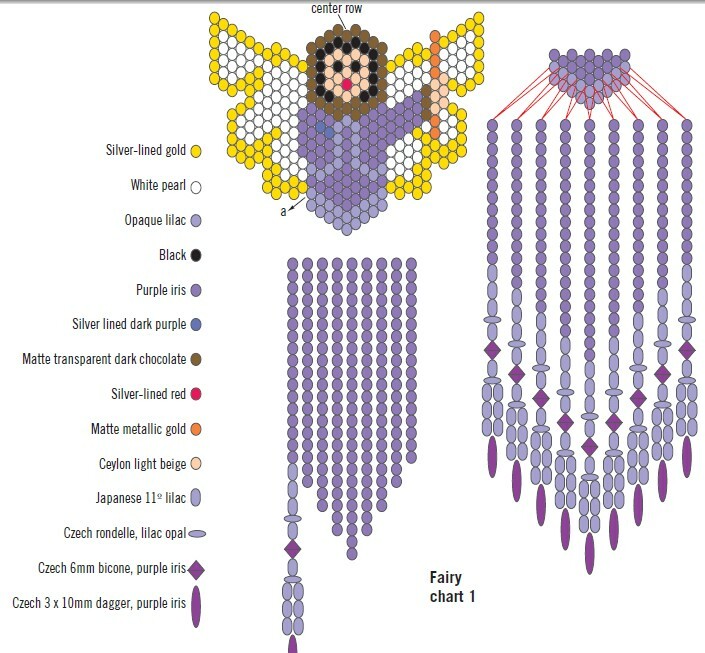 Figure 3: To stabilize the ladder, zigzag back through all the beads. Brick stitch Figure 4: Begin each row so no thread shows on the edge: String 2 beads. 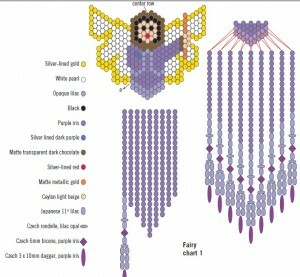 Go under the thread between the 2nd and 3rd beads on the ladder from back to front. Pull tight. Go up the 2nd bead added,then down the first.Come back up the second bead. Figure 5: For the remaining stitches on each row, pick up 1 bead. Pass the needle under the next loop on the row below from back to front. Go back up the new bead. Increasing brick stitch Figure 6: To increase by one bead at the edge of a row, string 2 beads and stitch under the thread between the first and second bead on the row below. Finish the stitch as in figure 4. Decreasing brick stitch Figure 7: To decrease at the edge of a row, zig-zag back through the beads in the completed row to exit the bead just outside and below the first bead on the new row. String 2 beads and sew under the thread between the second and third beads over. 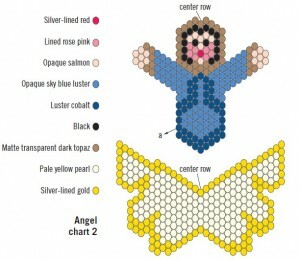 Complete the stitch as in figure 4.